Here is a fun thing to do next time you’re running around Zelda with nothing to do: try and make the big guys kill each other. That’s what Dorkly did in this video, doing a lot of mundane dragging and leading to lure bad guys like Guardians and Talus into the same space then trying to make them go at it. And the first rule is that we’re all going to talk about it. Now, a lot of the time, it doesn’t quite work. This isn’t Horizon Zero Dawn, and while some enemies will gladly square off, as you’ll see others are still more focused on killing you, regardless of the damage they’re taking from fellow foes. Still, when it does happen, it’s a sight to behold. 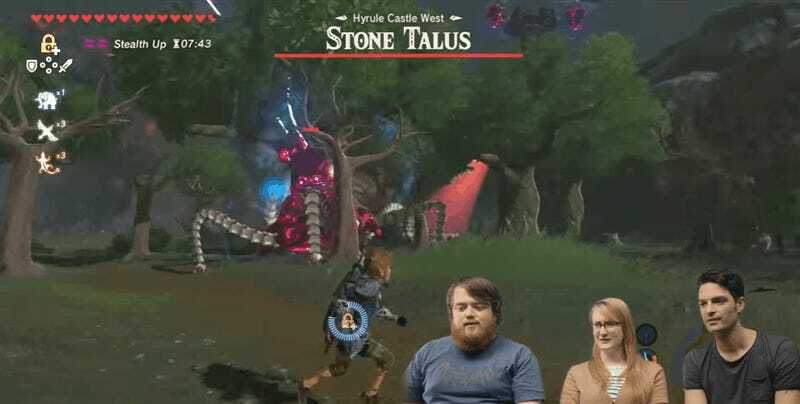 That Stone Talus packs one hell of a punch.